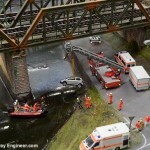 Don’t have space for a model railway? Here are some suggestions that may help. 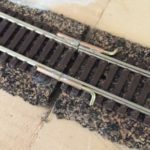 In a recent poll of members of the companion community to Model Railway Engineer.com, I asked what prevented those who would like a model railway but didn’t from creating one. The number one answer, and by quite some margin, was lack of space. 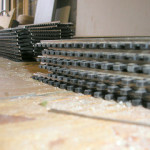 In fact, space restrictions were cited as the reason for not building a layout for their model trains by well over double the number that the next response received (cost). But there are options for those who think they don’t have space. If you’re really pushed for space but are itching to having a layout to explore the hobby with, develop your skills or just run trains take a look at the Scalescenes box file. 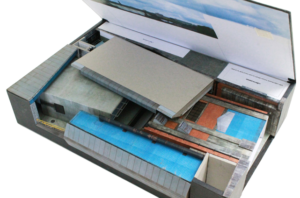 This is a handy kit that contains everything you’ll need minus the track, electrics and loco to create an OO gauge model railway in a standard stationary box file. Yep, one of those office storage boxes that a couple of inches deep and approx. the length and width of a sheet of A4, just over 70mm deep (when closed), around 400mm long and 250mm wide. Surely, everyone has space for this? It’s an industrial shunting layout so there isn’t much room for train movement and you’ll need to run short locos – such as a Peckett or one of two of Hornby’s new locos — the Ruston & Hornsby 48DS 0-4-0 — would be ideal! As a layout for space limited this really can’t be beaten, it even folds shut to can be kept on a shelf when not in use. The above box-file layout provides an answer for those who want an OO gauge railway and no space. There is an alternative. 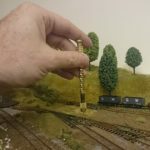 N Gauge is much smaller than OO gauge and Z gauge is even smaller still, meaning you can make not just a shunting layout but perhaps a small branch line. Both are small enough to create a fully featured layout in a glass-top coffee table, mantle place, or case that you can be packed away under a bed when not in use. The Z gauge plan seen here, for example, will give you a continuous running line, station, harbour and industry zone and all in a storage trunk. Enough to keep anyone happy yet in space that even small flats can accommodate. Of course, it’s possible you might not have space for even one of these space saving ideas. But there are still options to get your fix. 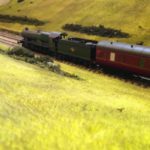 For starters, join the Model Railway Engineer community and see if there’s someone near you who might be able or willing to share their hobby and let you help them on their layout. I know quite a few people who have found such arrangements mutually beneficial, with one having space but not the knowledge and vice versa and by combining they can create great layouts. Alternatively, check the group to see if there’s a model railway club near you. 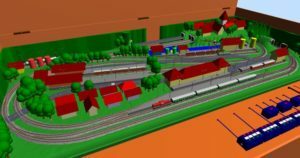 While there aren’t as many as there used to be most large towns still have them and they provide a great opportunity to keep your railway building and operating pangs under control. Finally, consider your office space. This is possibly the most restrictive option but still has possibilities. Could you perhaps have a railway on your desk or running between you and your colleague’s desks? This isn’t as odd as it sounds, as Tim Dunn’s office shows. 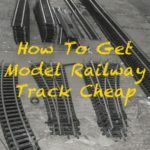 Hopefully, these three ideas will give you an idea and you’ll be able to get your model railway fix no matter how much space you have.